Fill your berry containers quickly and easily with this thornless variety. 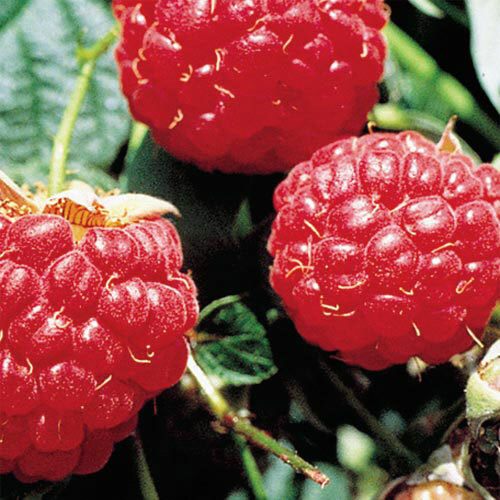 Mammoth Red Raspberry produces large yields—about 1-2 quarts per plant—of very large, sweetly flavored fruits from mid-June to early July. The berries, up to 1 in. long, are highly flavored and good for fresh eating, freezing, canning, desserts, jams and jellies. The vines grow 6-8 ft. tall and require support due to the large crop of berries. Mammoth Red Raspberry plants grow best when planted in organic, well-drained, slightly acidic, sandy loam soil in full sun to partial shade. Self-pollinating. Zones 4-8. Zones4 - 8 (-30° F.). FruitVery large, red fruit up to 1 inch. Soil RequirementsOrganic, well-drained, slightly acidic, sandy loam soil. 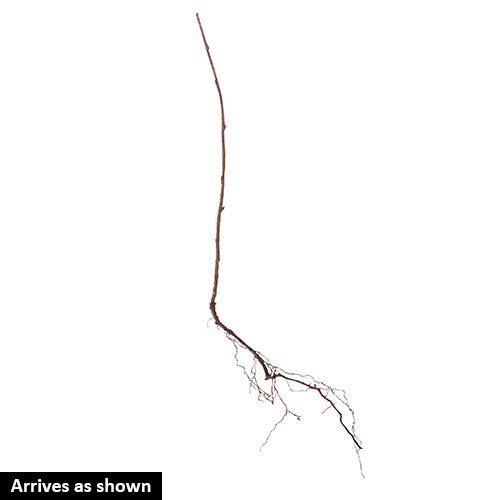 PruningIn late Winter, early Spring, prune and thin your raspberry plants. Any time of the year, you can prune out dead or diseased canes. CommentsVery sweet and highly flavored. Thornless canes. Planting: In heavy clay, add 1/2 sand and 1/2 compost or composted manure. Crown should be at soil level. Prune dormant bareroot to 2 inches. If the plant is potted, no pruning is necessary when planting. Growth: Produces on one year old stems. Reduce old canes after they have produced, making room for new canes. In Summer, cut young canes back to 4 feet. Keep laterals to 2 - 3 feet. Needs supporting due to large crops of berries. RSETRICTED STATES: AE, AK, GU, HI, PR. YieldApproximately 1 - 2 quarts.